The roots of Adfinem lie in Carlisle, where, having played keyboards with 'Soul System' and 'Beyond Reach', Paul Fisher decided that he wanted to write more of his own original work, and posted an ad in Omega Music, in Brampton. Lee Adams, a classically trained pianist, purchased his first synthesizer from Omega, where he became a regular, spotting the ad by chance. The pair brought in a vocalist, and went on as a three-piece to release the 2001 album "Live & Learn" (5 stars in Rock Sound magazine), performing a number of successful gigs, including a support slot for Fad Gadget (R.I.P. ), at the London Astoria, as well as attracting interest from a number of labels, including Mute Records. 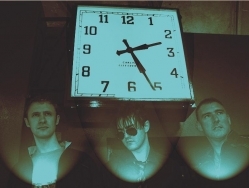 After a break from music, they spotted an internet ad posted by young Manchester-based vocalist Simon McDonald in March of 2006, and following successful meetings and recordings, Adfinem was reborn that April. The three are currently working on material for an EP release with Ade Fenton, (producer of Gary Numan's "Jagged" album), and long awaited 2nd album, for which they are currenty looking for a new deal. They have also begun touring in between recordings, including a slot with Robert Goerl, of D.A.F. fame, in London, and The Cruxshadows.